Wrong fuel in car? Fuel drain £99 - Call Wrong Fuel Recovery on 0800 772 3842. Mobile fuel drain, for drivers who have put the wrong fuel in their car. 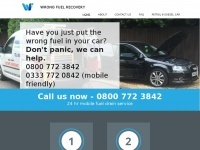 1 review has been written for Wrongfuel-recovery.co.uk yet. Excellent service after i put the wrong fuel in my car. They arrived and drained all the wrong fuel from my car and the technician was excellent. Thank you Wrong Fuel Recovery for your fantastic service!